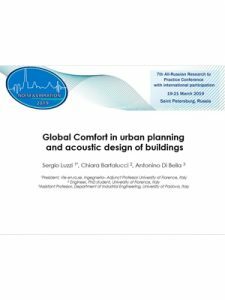 Some relevant theories have been proposed in the last decades, regarding a global comfort approach for urban planning and building design. In the frame of the 2002/49/EC Directive, the concept of action plan and its development have been proposed as solutions for reducing noise in cities and to enhance a better acoustic quality in urban places, allowing citizens to spend their time with pleasure in public areas. At the same time, the European legislation regarding building acoustic and noise in workplaces have started to consider sound insulation and sound performance of building as important issues for the quality of life in the built environment. 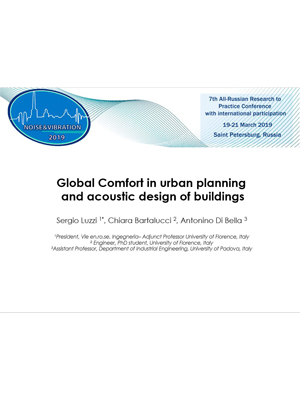 In this paper the authors, moving from their experience in writing action plans for Italian cities and designing actions on urban areas and public buildings like schools and hospitals, describe some possible application of the general global comfort approach to some case studies.